In the last blog we discussed 10 planning steps for sea level rises. When planning 50-100 years other factors can come into play as well. As a result, to allow flexibility in the analysis due to the range of increases within the different time periods, an approach that uses incremental increases of 1, 2, and 3 feet of SLR is suggested. Hence infrastructure is built to meet milestones, not arbitrary dates lessening the potential for stranded assets.. The increments can work as threshold values in planning considerations in terms of allowing planners the ability to know ahead of time where the next set of vulnerable areas will be to allow a for proactive response approach that can be matched to the observed future sea levels. But prior to developing infrastructure plans, the local community needs to define an acceptable level of service (LOS) for the community. A level service would indicate how often it is acceptable for flooding to occur in a community on an annual basis. 1% is 4 days per years and for a place like Miami Beach, this is nearly 2 ft NAVD88, well above the mean high tide. The failure to establish an acceptable LOS is often the cause of failure or loss of confidence in a plan at a later point in time. The effects of SLR of the level of service should be used to update the mapping to demonstrate how the level of service changes, so that a long-term LOS can be defined and used for near-term planning. With the LOS known, the vulnerability assessment is developed using a GIS based map of topography and the groundwater levels associated with wet and dry season water levels. LiDAR is a useful tool that may be available at very high resolution in coastal areas. Topographic maps must be “ground-truthed” by tying it to local benchmarks and transportation plans. 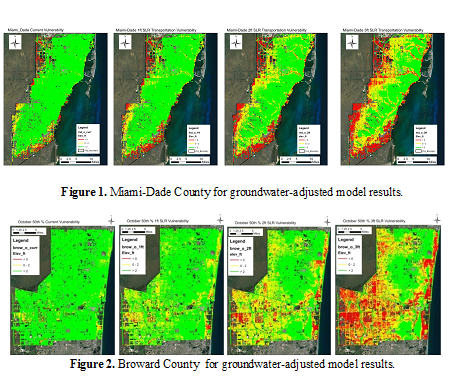 USGS groundwater and NOAA tidal data from local monitoring stations to correlate with the groundwater information. Based on the results of these efforts, the GIS-based mapping will provide areas of likely flooding. GIS map should be updated with layers of information for water mains, sewer mains, canals, catch basins, weirs and stormwater facilities. Updating with critical infrastructure will provide a view of vulnerability of critical infrastructure that will be funded by the public sector. Ultimately policy makers will need more information to prioritize the needed improvements. For example, a major goal may be to reduce Economic Vulnerability. This means identifying where economic activity occurs and potential jobs. At-risk populations, valuable property (tax base) and emergency response may be drivers, which means data from other sources should be added. The next step is to analyze vulnerability spatially, by overlaying development priorities with expected climate change on GIS maps to identify hotspots where adaptation activities should be focused. This effort includes identification of the critical data gaps which, when filled, will enable more precise identification of at risk infrastructure and predictions of impacts on physical infrastructure and on communities. The final deliverable will include descriptions of the recommended concepts including schematics, cost estimates, and implementation plan. So why go through all this. Let’s go back to the beginning. It has to do with community confidence in its leaders. Resident look at whether their property will be protected. Businesses look at long-term viability when making decisions about relocating enterprises. The insurance industry, which has traditionally been focused on a one year vision of risk, is beginning to discuss long-term risks and not insuring property rebuild is risk-prone areas. That will affect how bankers look at lending practices, which likely will decrease property values. Hence it is in the community’s interests to develop a planning framework to adapt to sea level rise and protect vulnerable infrastructure through a long-term plan. Plan or…. I had to post this Miami Herald Article (p 1 and 2) regarding a sea level rise hearing conducted by the US senate here in Miami Beach. I was one of six asked to testify. This is a very rare opportunity. I was very privileged by that opportunity. Check it out.